University College London (UCL) ECMC is committed to performing world-class clinical cancer research to develop new cancer therapies. It does this by conducting early-phase clinical trials that are fully informed by modern molecular and imaging technologies. There is particular expertise and dedicated facilities for trials of antibody-targeted and cellular therapies, immunotherapy and small molecules. 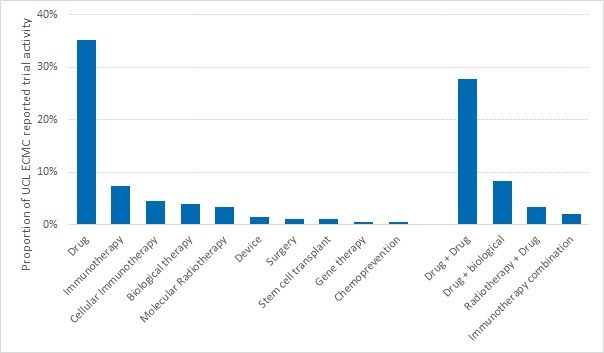 Drug development is supported by strengths in biomarker development, medical bioinformatics and cancer genomics. 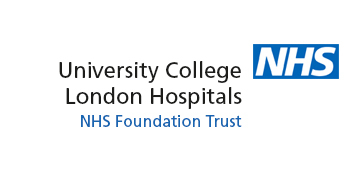 The Centre supports the Clinical Research Facility (CRF) based at UCLH where a team of dedicated medical staff including oncologists, research nurses and trial coordinators work together on a large portfolio of clinical trials, offering patients access to the latest new drugs. In addition, the Centre provides key infrastructure for laboratories including the GCLP facility and molecular pathology laboratories which support translational cancer research both at UCL and throughout the Network. The UCL ECMC collaborates with other centres across the ECMC; recruiting to ECMC trials, providing educational meetings and engaging patients and the public in our work. Expertise and resources are thereby deployed to maximum effect for patient benefit. Tim Meyer is Professor of Experimental Cancer Medicine at UCL and is Joint-Lead for the UCL ECMC. He is a Medical Oncologist with a clinical interest in Hepatocellular and Neuroendocrine for which he runs specialist clinics at the Royal Free Hospital. He also runs a research program at the UCL Cancer Institute which is mainly focussed on biomarker development, particularly in the field of circulating tumour cells. Professor Meyer is also the Cancer Director for the NIHR/Wellcome UCH Clinical Research Facility which provides dedicated infrastructure for Cancer Drug Development and is central to the delivery of UCL’s ECMC program. At any one time, the unit has between 25-30 clinical trials evaluating new cancer therapies, and these are led by a team of highly experienced investigators. There is a close link between partner hospitals and the UCL Cancer Institute providing a seamless link between the laboratory bench and the clinic. Within the centre there is particular expertise in immunotherapy, cell-based therapy, biological therapy, imaging and cancer genomics. John Hartley is Professor of Cancer Studies in the UCL Cancer Institute, Co-Lead of the UCL Experimental Cancer Medicine Centre and head of the UCL ECMC GCLP Facility. He is also Director of the Cancer Research UK Drug-DNA Interactions Research Group where his research activities are focused around the development of novel cancer therapies, particularly involving DNA as a target. He has been for many years the chair of the CRUK Protocol Safety and Review Board and sits on the ECMC Steering Committee. Professor John Anderson has worked at Great Ormond Street Hospital and the Institute of Child Health (ICH) since 1998. Initially a Clinical Lecturer and subsequently Senior Clinical Lecturer/Honorary Consultant Oncologist, he became University Reader in 2009. Dr. Darren Hargrave joined GOSH in 2011 having previously worked at the Royal Marsden Hospital in London. He specialises in paediatric neuro-oncology (tumours of the brain and spine) and the development of new anti-cancer drugs for children and adolescents. He trained in the UK and Canada and is a member of both national and international groups in the fields of paediatric neuro-oncology and drug development. He has been the Chair of the European SIOPE High Grade Glioma working group. He is a Chief Investigator of several completed, on-going and planned clinical trials in paediatric cancer. 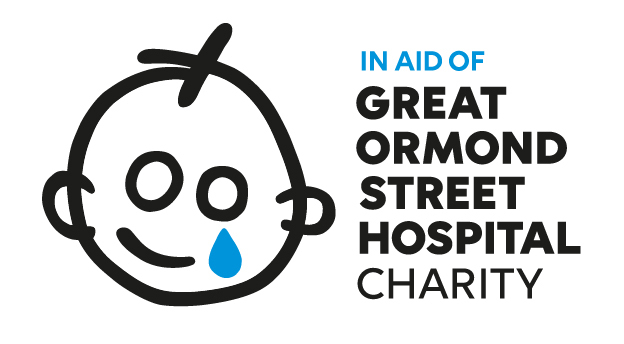 UCL/Great Ormond Street Hospital (GOSH) is also a paediatric centre. GOSH and the teenage cancer unit at UCLH comprise a unified Principal Treatment Centre (PTC) for those diagnosed with cancer aged 0-19 yrs in North London, treating over 300 new patients a year. Both units have an established infrastructure for running early phase trials linked to preclinical research at the Institute of Child Health and the UCL Cancer Institute, including dedicated Clinical Research Facilities (CRFs). 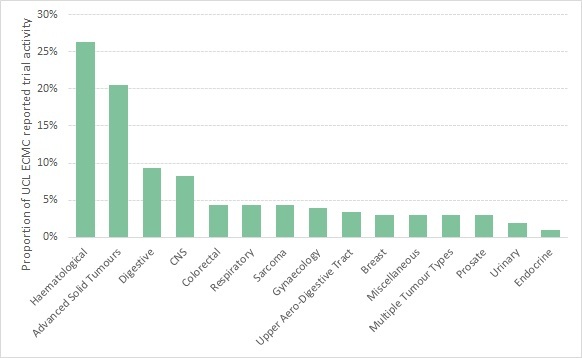 They have recruited 18 patients to ITCC trials, 16 patients to a CRUK-supported phase I trial of dendritic cell vaccination in osteosarcoma and have strong clinical leadership and substantial grant funding (>£1.3 million) for in-house early phase trials in immunotherapy. There is a well-developed strategy to further enhance preclinical and early phase clinical trial research across the joint PTC. This includes the planned appointment in February 2011 of a new consultant with 50% of their time dedicated to experimental therapeutics. This post will increase the trial portfolio available to the paediatric and adolescent age groups, through interfacing with the adult ECMC and the CRF at UCH and working directly with Professor Hilary Calvert, UCL Partners Director of Drug Discovery and Development. Both GOSH and UCLH have facilities to accommodate patients and families who need to travel to London. TRACERx (TRAcking Cancer Evolution through therapy (Rx)) is a prospective observational cohort study that aims to transform our understanding of non-small cell lung cancer (NSCLC) through translational research. It is a large flagship study for the main funder, Cancer Research UK. Led by Professor Charles Swanton at UCL, TRACERx is a major collaboration between experts from a wide range of disciplines working together to integrate clinical, histopathological and genomic data from patients with NSCLC. Taking place over nine years and involving 842 patients from up to 20 hospitals across the UK, the study aims to define how cancer clonal heterogeneity affects the risk of recurrence and survival, and how cancer subclones compete, adapt and evolve from diagnosis to relapse. In turn this will define how analysis of intratumour heterogeneity can inform patient stratification and the development of novel targeted and immune based therapies. TRACERx patients, whose cancer comes back, have the opportunity to enter clinical trials of novel therapies (depending on test results of their tissue samples) from which they could benefit. Broad range of interests in small molecules, protein, physical and cellular therapies and mechanisms related to them. ECMC funding provides infrastructure support for early phase and translational research. From the ECMC London UCL portfolio, the following trials have been carried out.